There’s a beautiful metaphor here, and one that’s consistent with Dale Cooper’s philosophy, and usually with David Lynch’s narrative approach. It’s the illogical logic of yielding to intuition rather than straightforward investigation. Unfortunately, “The Return, Part 9” doesn’t follow its own advice. There’s so much information packed into this episode, but however stylishly presented or wittily framed it is, getting it all out feels just a little bit like a chore. 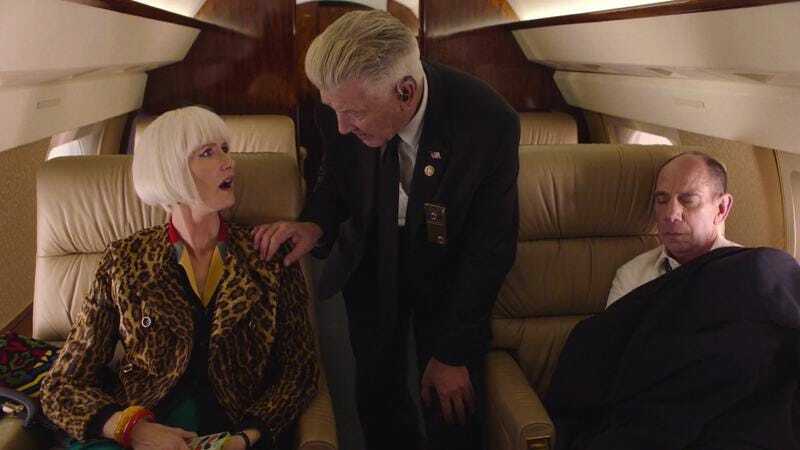 There’s been a lot of talk (not least from David Lynch) about viewing the revival of Twin Peaks less as a television series and more as an 18-hour movie. But this is the first episode that suffers badly from the episodic nature of its broadcast. After the spectacular (and, for some, challenging) “Part 8” and a week’s break, it’s not surprising “Part 9” tries to ease viewers back in by returning to the structure of a procedural. It is a little surprising to see those procedural elements, which Lynch and Mark Frost typically master with such flair, presented clumsily. A few scenes into “The Return, Part 9,” I turned to my spouse (also a TV critic, and also a Twin Peaks fan since its original broadcast) and said—oh, so gently—“I don’t mean this as a slight, but this reminds me of the Diane Keaton episode.” By episode’s end, I’d reconsidered that assessment. Not the part about “Part 9” reminding me of what is arguably the worst Twin Peaks episode. The part about it not being a slight. Like the Keaton-directed “Episode 22” (also known as “Slaves And Masters”), “The Return, Part 9” has a lot of pieces to move around the chessboard. 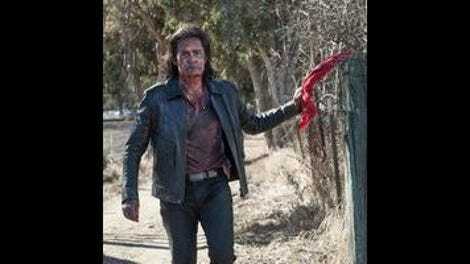 In this episode, Dark Coop walks away from the depredations of the woodsmen after Ray’s attack; Chantal and Hutch provide Dark Coop with medical care and a “clean phone”; with that phone, he texts a cryptic message (“Around the dinner table, the conversation is lively”) to Diane; the Las Vegas police learn there’s no trace of Dougie Jones’ existence prior to 1997; Dark Coop puts a hit on Warden Murphy and reminds Duncan Todd (Patrick Fischler) of the still-outstanding hit on Dougie; Garland Briggs’ message, along with the meta-message of his anticipation that they’ll come calling for it, is revealed; Gordon confides in Diane that he’s chasing another Blue Rose case. If that’s not enough information overload, the world of Twin Peaks is once again escaping the confines of the television screen with the “strange little blog” William Hastings maintained with Ruth Davenport, which provides plenty of links to keep us busy until next week. Even the new information—the most striking of which is Bill’s blog exploring the possibility of contact with other dimensions—is delivered with surprisingly little grace. Some of this lack of grace is intentional, or at least it’s lampshaded by the writing and performances. In one scene, Jerry Horne is paralyzed by the conviction that his foot is not his foot, and his assaults on it leave him bowled over in the dirt. In another, as Diane and Gordon bond on the Buckhorn PD doorstep, Agent Tamara Preston’s repertoire of provocative stances dissolves into self-conscious fidgeting. The latter is especially gratifying, as it indicates that Lynch and Chrysta Bell both realize Agent Preston’s self-presentation is gratingly false. In “Part 9,” over and over, characters—and especially investigators—are framed as trios. First, there’s the unlikely team of three brothers working together as detectives in Las Vegas. They investigate cases together, they laugh uncannily at the same unfunny jokes, they turn in unison on cue. As they take Ike “The Spike” into custody, their posture is mirrored by three unnamed officers at the other end of the hotel corridor. Bobby, Hawk, and Sheriff Truman make a more competent group but just as distinctive a trio. They arrive at Betty Briggs’ home together, refuse coffee in unison, then cheerfully and in unison accept her second offer of coffee after she delivers the Major’s message. They mill into, around, and out of the police station together. There’s no narrative reason for their encounter with Chad (John Pirruccello), who’s stinking up the conference room with his forbidden lunch, except to reinforce how little they like or trust their fellow officer… and to reinforce the unity of their group by excluding a fourth person from it. Even Lucy, whom they like and trust, loudly excludes herself from their company, announcing she’s “not here” and waving them off as she eats her lunch in her cubicle. The third group of investigators is the most fluid. Gordon, Albert, and Tamara; Gordon, Diane, and Tamara; Diane, Gordon, and Albert. They’re traveling together, but they keep breaking and recombining into different trios and pairs, trying to find a balance just as they’re trying to find (and, each in their own way, fearful of finding) a solution to the mystery around the man they keep calling “Cooper,” even though they know better. “The Return, Part 9” is jam-packed with information vital to the the show’s mysteries, but it feels disappointingly like part filler, part exposition machine. Like “The Return, Part 1 & 2” and “The Return, Part 3 & 4,” “Part 9” might have benefitted from a double-episode broadcast, either as an anchor to “Part 8” (though it’s hard to imagine anything following that making much of an impression, and that’s doubly true of the check-the-boxes revelations of tonight’s episode) or coupled up with whatever Twin Peaks has in store for us next week. As so often on television, and especially on Twin Peaks, it isn’t what’s said but how it’s said that makes the most impact. Even in its untidy info dump, “The Return, Part 9” manages to layer emotional connections into otherwise unrelated moments. Think of Betty Briggs recounting the Major’s message, adding, “He squeezed my shoulders when he told me this.” In the FBI airplane banking above South Dakota, as Gordon breaks the news to Diane that they’re making one more stop before he lets her go home, he tells her, “This is important and it could be of interest to you,” and—intently, repeatedly, and very clearly—he squeezes her shoulder. A similar unspoken moment of connection occurs when Dougie/Cooper, sitting blankly in the waiting room while the police review his file, drinks coffee from a mug with a badge on it, stares at a flag, and glances at an anonymous woman in red pumps (echoes of Audrey Horne’s first appearance) and seems to hear whispers of who he once was. That hint of Dale Cooper surfacing is more inspiring than an entire episode of connecting the dots. It is happening again, again: Who expected the return of Johnny Horne? He’s played here not by Robert Davenport, who played him in the pilot, nor by Robert Bauer, who played him subsequently, but by stuntman Erik Rondell. “The Search for the Zone is primarily maintained by Bill Hastings, with occasional contributions from Heinrich Viegel.” Any guesses who Heinrich Viegel is going to be? Sky Ferreira is convincingly grubby as Ella, leaving me equally worried about her drug habit, her missing time, and her gruesome armpit rash.